Members of the public pay their respects to former astronaut and U.S. 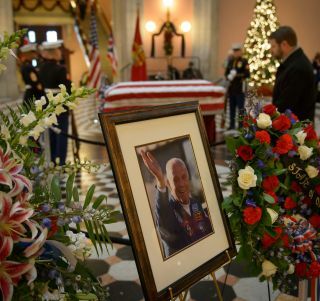 Senator John Glenn as he lies in repose, under a United States Marine honor guard, in the Rotunda of the Ohio Statehouse in Columbus, Friday, Dec. 16, 2016. NASA will celebrate the life and legacy of pioneering astronaut John Glenn with a memorial service at Ohio State University today (Dec. 17), and space agency officials will provide a live webcast of the service for the public. Ohio State University in Columbus will host the memorial service for Glenn, who died on Dec. 8 at age 95. The service, entitiled "John Glenn: Celebrating a Life of Service," will begin at 2 p.m. EST (1900 GMT) and will be streamed live on NASA TV. You can also watch the webcast here, courtesy of NASA TV. NASA Administrator Charles Bolden "will pay tribute to Glenn’s early contributions to human spaceflight and enduring legacy" during the program, NASA officials added. You can see NASA's full tribute to John Glenn at the agency's dedicated tribute website here: https://www.nasa.gov/content/profile-of-john-glenn.